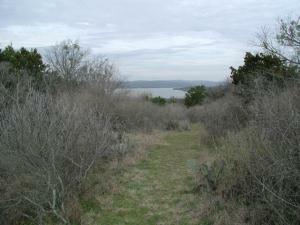 I had not known about this preserve until I researched Cedar Park parks for this trip. I postponed going a couple of days since it rained the morning I had intended to hike it. As it turns out, 2 days was not enough for things to dry out. I only had running shoes and not hiking boots and they muddy and wet from the remaining dew on the grasses. It was still an enjoyable hike. Not another soul on the trails, though the close proximity of Anderson Mill Road provides a constant reminder that one is not far from suburbia. At one point I observed four deer (two of them quite young) darting across the open grassland in search of some better cover. I also did the small crushed granite loop of the adjacent Ranch at Cypress Creek Park afterwards, which you can see on my map. Got a walk in early in the morning and obviously I was not the only person who thought of this. Because it had rained yesterday I wanted to avoid any dirt trails and I had observed the paved trail here when I last drove by, so it seemed ideal. The length of the trail here is not very long, so I made a few loops to get a bit over a mile and a half in. First Austin hike in over a year! Coppertone and I made a brief visit back to Austin to check on my Dad and decided to log a quick stroll at a park we'd not previously hiked. Actually, Coppertone had been here before for some geocaching, but not to log a hike. We parked at a nearby office that didn't look like they had 24 hour security like Apple and did what amounts to the outer loop of the park. It was starting to get a bit warm and didn't want to get too sweaty given our other stops today, so this small loop was all we managed to get in. Thankfully, the maintainers of the park mowed down a good width of grass over most of the trail, which saved us from too much of a chigger risk. Coppertone is pretty sure she still got one of them here though. Reminders of our previous home! Coppertone and I found five caches along the trail here on a recent visit back to attend a friend's wedding. We had seen this greenbelt on the maps, but had never visited before. We parked on Adirondack Trail, at the end of Steck Avenue. The trail starting here is a bit more informal and at times appears more than a path along the creek bed. The trail is a bit more defined after it meets up with the trail coming in from Hyridge Drive. Due to recent rains the creeks were flowing a bit more than normal and so we were unable to make it all the way to the trailhead on Great Hills Trail and had to turn back. If we had been in hiking boots we would have given it a shot, but we were wearing our only pairs of non-dress shoes so retraced our steps back to Adirondack Trail.